I finally managed to obtain some old school D20s -- numbered 0-9 twice -- manufactured by Chessex, so they're well made and unlikely to wear down the way my first set of polyhedrals dice did. Now some might rightly wonder why I wanted to obtain these dice in the first place. After all, dice technology has come along way since the days of the dice illustrated to the left. Why would I want to go back to the old ways, when a D20 had to pull triple duty? It's a somewhat complicated question and answering it hits upon a number of points about my own approach to old school gaming. First, let me say that, despiten appearances, I don't want to go back to the old days. Not really. I still have the first dice I ever owned and could use them if I wanted to. Better yet, I could buy new examples of these same dice, if I really wanted to. I don't, because those old dice were, frankly, terrible. I have absolutely no desire to use them, particularly if I'm able to obtain, as I was, more modern dice that replicate the experience of using the older dice. But why replicate the experience at all? There are a couple of reasons for this. The first is nostalgia, pure and simple. I'm not usually given to huge bouts of nostalgia. 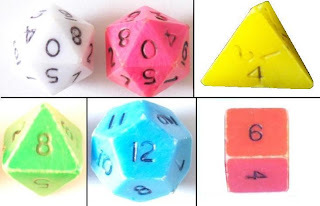 In the case of polyhedral dice, though, I will confess to missing those early days when I first encountered these strange random number generators and was frankly baffled by how to use the D20 at all. As with so much of my early D&D education, I think it was my friend Mike's older brother who explained how you used the dice. For the longest time, I was baffled as to how to generate a "1," since I rolled two D20s and tallied the result, which meant a range from 2-20, not 1-20. My next set of dice, which were translucent, had little plus signs on half the numbers, indicating when to add 10 to the result of the dice roll. I have very fond memories of those early dice and I want to remember them in a concrete way. The other reason is curiosity. Does not using a D10 make a difference to gameplay? I remember when I first saw a D10 -- when my friend Shawn bought the Moldvay Basic Set -- and I thought it looked "wrong." I knew nothing of regular solids at that point, but, on some level, I intuited that the D10 was a fraud and so it is. This didn't stop us from using it, of course, but I've long held the D10 in mild contempt and still do on some level. In any case, D&D thrived for many years before the advent of the D10 and I have to wonder if its absence had any effect on the way people played "back in the day." I'm not sure that it did nor am I sure, coming as I do from a post-D10 time, if I'll even be able to get into the mindset of gamers who knew nothing of the D10. Still, I want to give it a try and see if there's a noticeable difference. Some will inevitably see this as fogeyism of the worst kind, but I don't. As I grow older, I have become more firmly convinced that there are many experiences and insights that we're in the process of losing -- or already have lost -- because our society is no longer structured that makes access to them difficult, if not impossible. Others obviously agree, which is why you see things like "Turn Off the TV Week" and the like. The central idea is that, by cutting onself off this or that modern "convenience," we might rediscover simpler things we've lost touch with. In some cases, I'm sure these endeavors do little or nothing. However, I'm sure they have an effect on at least a small percentage of those who participate and it's that kind of effect that I'm hoping for with this little experiment. Another thing of which I grow ever more convinced is that roleplaying, as an activity, is an old fashioned one. It's from a different time, a different culture, one that was more broadly "literary" and less influenced by visual media. You can see this in the way OD&D and AD&D, for example, reference novels and short stories in their texts, while 3e's rulebooks did not include a bibliography at all and the few supplements that did so had more entries for movies and TV shows than for actual books. I suspect that a lot of the disconnect I feel with many modern RPGs -- D&D most of all -- is that they're products of a very different culture than the one from which the hobby sprang and into which I was initiated in the winter of 1979. I will forever associate D&D with reading certain authors and, while my understanding of "fantasy" has broadened since then, those early experiences remain foundational, just as my early experiences of play do. And that play included D20s numbered 0-9 twice. I think I'm behind the times. I pulled out a 0-9 twice d20 at a game fairly recently and was surprised to see my fellow gamers -- who are mostly my age, so I wouldn't have expected this of them -- react as if I'd pulled out a turkey quill pen and an ink pot and started writing on my character sheet in Chaucerian English. roleplaying, as an activity, is an old fashioned one. It requires patience and a commitment of time, but so do flashmobbing and mentos/coke stunts. It's a weird thing, I don't think the time issue answers it at all... maybe it's just that it makes poor youtube fodder. Ah, the old Gamescience "plus 20" dice, with the little + sign next to half of the numbers. I have a dozen or so of them and they're my d10 and d20 of choice. It's not really nostalgia (although I've had one of them for well over twenty years) so much as preferring the way they roll. Out of interest, what is "wrong" with the modern d10s? That's it? I thought there was more to it than that, but I can understand it, certainly. Kelvin: the weird little surfaces along the equator of old d10's were kind of an aesthetic turn-off. Now that dice are tumbled to round the edges it's not so much an issue. Though lately I've been thinking about getting some of Zocchi's non-tumbled dice. Speaking of Zocchi, I own a couple modern d20's marked 0 to 9 because his Star Fleet Battle Manual is written with them in mind. I sold my copies of SFBM a while back but kept the dice. Though lately I've been thinking about getting some of Zocchi's non-tumbled dice. Are there any examples of those online anywhere? I'd love to see what they look like. I definitely understand it. It had never occurred to me before that the d10 is not a regular solid, and now that I notice it, it does make it seem like an outsider when arrayed with its companions. I'm not sure that's enough to make me stop using it, but the d10 definitely stands out now! Heh. I remember getting MERP and having the two tiny 0-9x2 d20s in that box. I also recall my being such a dummy that I was angered that for a while I couldn't figure out how to roll a "100", while at the same time not understanding exactly what rolling a 00 meant. Folly of youth. Also, you make a good point about the inspirational material mentioned in rpgs. I hadn't noticed or thought of it until now, but now that I haven...I can't remember the last time I saw books listed as inspirational material in an rpg. I own that d8. Well, one of its brothers (class of '79). With the exception of my long lost 20 sider (0-9, twice, and sharpied), I have all those original polyhedrons. I smile every time I see them, but I retired them a long time ago. However, they were - and remain - better than Holmes edition chits drawn from dixie cups. Very much agreed. I hated the chits and felt cheated that my Holmes box didn't come with real dice. I’m not a big fan of the “true d10” either for aesthetic reasons. I still have my sharp-edged, un-inked d20s with the plus signs. My first two sets of dice beyond what came in my Moldvay box. (Still have those too.) I don’t care what Professor Z says, though, I like tumbled, professionally inked dice whether they’re slightly biased or not. Besides, I’ve never been happy with any of my attempts to ink (or crayon) those old dice. I did finally find a pair of d20s—tumbled and inked—numbered 0–9 twice, but without the plus signs. Plus, they’re ugly colors. I enjoy them, though. I’m also not a fan of d4s. Sometime I’m going to order some d8s numbered 1–4 twice. I don’t care what Professor Z says, though, I like tumbled, professionally inked dice whether they’re slightly biased or not. Lou Zocchi thinks tumbled dice are biased? I'm not surprised he says that, but I'd never heard it before. It’s almost certainly true. The tumbling process randomly removes material. To make unbiased dice, you also have to carefully ensure that the volume of material missing for the numbers is the same on each face. (“20” would need to be shallower than “1”.) Likewise, inking should be controlled to ensure it adds the same amount of mass to each face. Even this isn’t ideal, since the distribution of mass on each face will differ. That’s why casino dice have sharp edges and the pips are filled flush with material the same density as the die itself. To make unbiased dice, you also have to carefully ensure that the volume of material missing for the numbers is the same on each face. (“20” would need to be shallower than “1”.) Likewise, inking should be controlled to ensure it adds the same amount of mass to each face. Check out the two videos with Colonel Zocchi from Kevin Cook’s dice site. I’d heard of his pitch before, but—not being much of a convention goer—never heard it myself. Heck, after watching that, I think for the next MSH session I’m going to put away my Koplow 20-sided d10s and break out my old Gamescience “classic +” 20-siders. Those are great videos! Thanks for sharing them.